Motorola is seemingly getting ready to launch a new smartphone that tries too hard to be an Apple iPhone X. 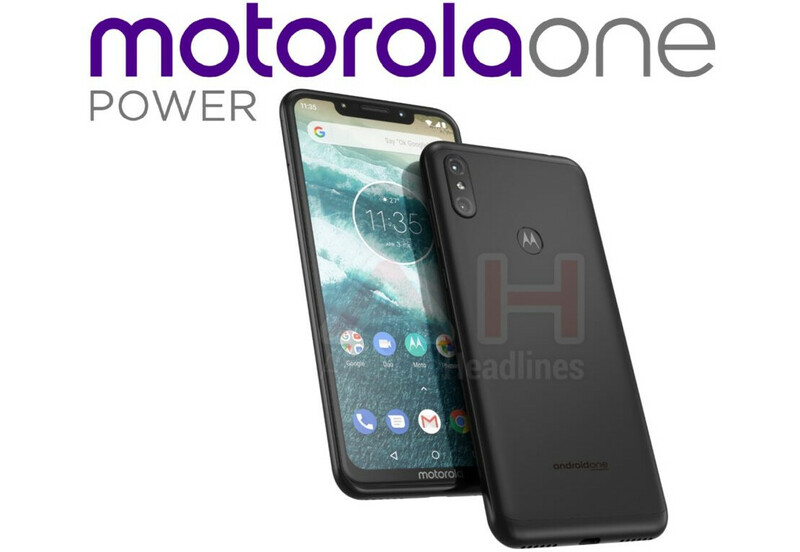 According to Android Headlines, the upcoming handset is called Motorola One Power, and should be part of Google's Android One program - this means it's going to receive fast software updates throughout its life. As you can see above, the alleged Motorola One Power features a nearly bezel-less display with an iPhone X-like notch. Not only that, but the handset's back hosts a dual camera that looks a lot like the rear camera of Apple's most advanced phone to date, while being positioned in the same upper-left corner. At the moment, the specs of the Motorola One Power are not known. There's also no word on when and where this handset should be released. In any case, this could become Motorola's second Android One device - after the Moto X4 of last year. According to a recent report, the Moto X4 will not have a proper successor, as development of the Moto X5 has been canceled. Alongside the One Power, Motorola is also expected to launch a Moto Z3 series sometime soon. Interestingly, the One Power may not have "Moto" in its name. Of course, for now, nothing is confirmed, but it looks like Motorola Mobility and its parent company Lenovo are having quite a busy year (after already releasing the Moto G6 and Moto E5 series). This is getting ridiculous. Every new phone is coming out as a replica of iPhone X. No distinct design language is left. Mototola, Xiaomi, Oppo, Huawei, Honor, Vivo, LG, Nokia, Asus, basically every OEM other than Samsung, Sony and HTC are straight away lifting design off iPhone. What a pathetic time in Smartphone industry. Never seen such a shameless and blind following. Is this what these brands are proud of ? One day they mock Apple and the next day they come out with a phone that mimicks the same Apple's iPhone. PS - Never been an Apple fan, never purchased any single product of theirs. They could have at least got rid of the chin at the bottom. What? You've never seen such a shameless and blind following. I present to you smartphone pre/after 2007 iPhone. Every smartphone currently available is a clone of the 2007 iPhone with updated specs. Everyone is using that template as their foundation, their starting point, until we throw that foundation out we will continue with that trajectory. What are you talking about? who cloned the old iphone. they werent worth cloning. Oh .. i gave your stupid comment + by mistake .. are crazy? All the phones are copy from the original iPhone? Well any phone should be in this shape easy to hold for humans .. what do you expect them to create? Triangle phones ? Yeah...I agree. It's really lame. Apple was right all along when they sued Samsung a few years ago for rounded corners and rectangles. This is too much. Nothing has really changed. Just the addition of Chinese oems. Just ignore them and you have what we previously had, Samsung, Htc, Sony. Moto is also Chinese. Ikr! Like wtf are these companies thinking.. whats so good about a notch? Theyre doing it just for the sake of copying the most successful phone, the iphone x, but doing so wont help them at all, the iphone x is selling well not because it has a f**king notch but rather because its an iphone and isheep will buy it anyway. Man! You don't have no market share at least have some self respect. Do these manufacturers actually listen to their customers? Nope they sit at Apple's headquarters and copy what they do next. Another day another notch. These companies have no shame. Gotta admit, when Apple adopts it, they all adopt it. The notch is the future. Nobody copied Essential's notch. Time to get over it already. OMG im loving it... is that a dual speaker or one large one under the motorola branding? also android one? wow, about time motorola! pretty sure that dual camera was not done first by Apple. Not going to be a popular comment but... From someone (me) who loves Android and actually loves the feel and build of the Iphone X, this kinda looks promising. If they made this thing the same size as the IX I would definelty buy it. Problem for me is Im sure it will be underpowered and low to mid range. So a no buy..
To me it looks alright, corners are a little too rounded but could live with it.